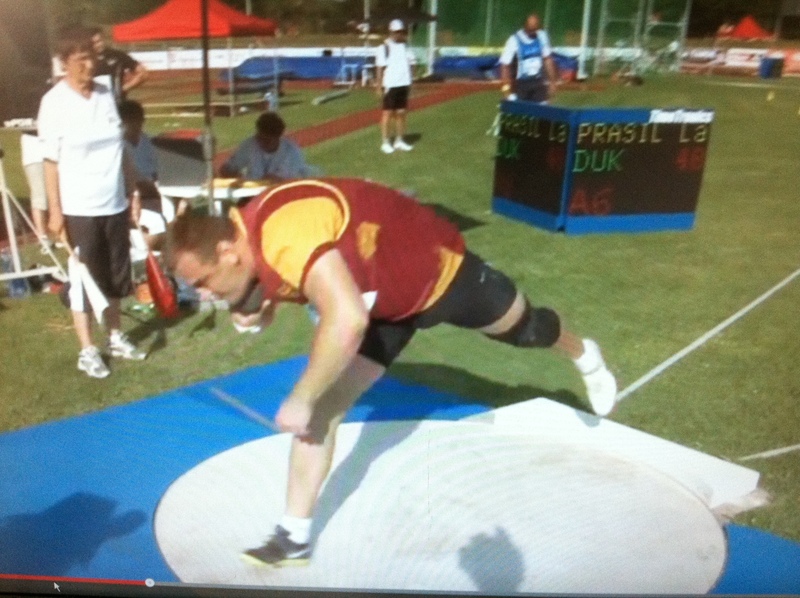 As a high school throws coach, I am a big fan of the fixed-feet, short-long glide. It allows the putter to accelerate the shot over a long, straight path and to work the ground for an extended time during the release. 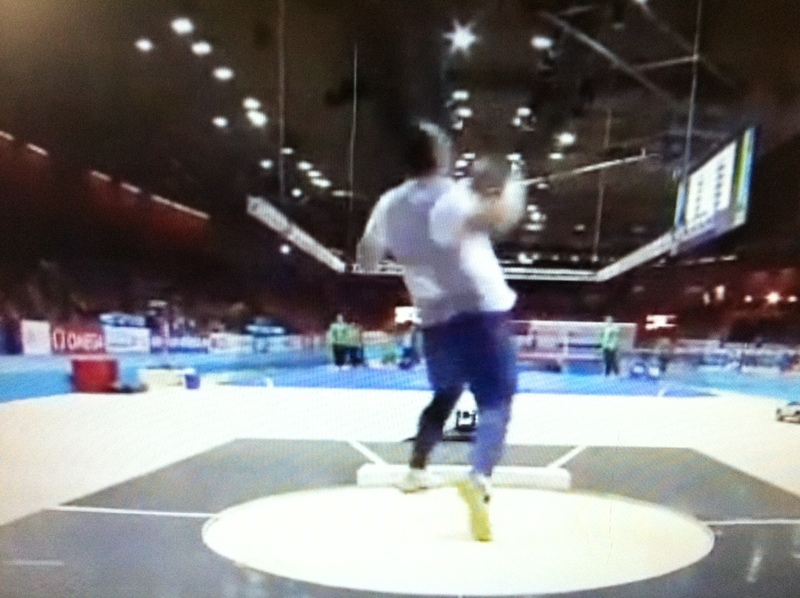 Currently, Ladislav Prasil, the 23-year-old Czech with a PB of 21.47m, provides a great template for young throwers wanting to learn the short-long. Notice that his upper body is completely limp. His back muscles are relaxed, his left arm passive. This sets Prasil up to accelerate the shot over a long path. He begins with the shot down low and will finish by releasing it high. A key technical point of the short-long glide is to let the left leg finish before pulling the right leg out of the back. This allows the putter to keep the shot on that long path that is so conducive to fine throws. His left leg has finished extending and the right foot is about to leave the concrete. Notice that his posture (the rounded upper back) has not changed. His eyes are still looking down and back. Notice also that Prasil has the shot placed under the right side of his jaw rather than against the the side of his neck (as is common with rotational putters). This placement, combined with his ablility to maintain a relaxed upper body during the glide phase of the put will allow him to accelerate the shot along a straight path as perceived from a vantage point directly behind the ring. We all know that a sprinter accelerates best when following a straight route rather than weaving from one side of the lane to the other. 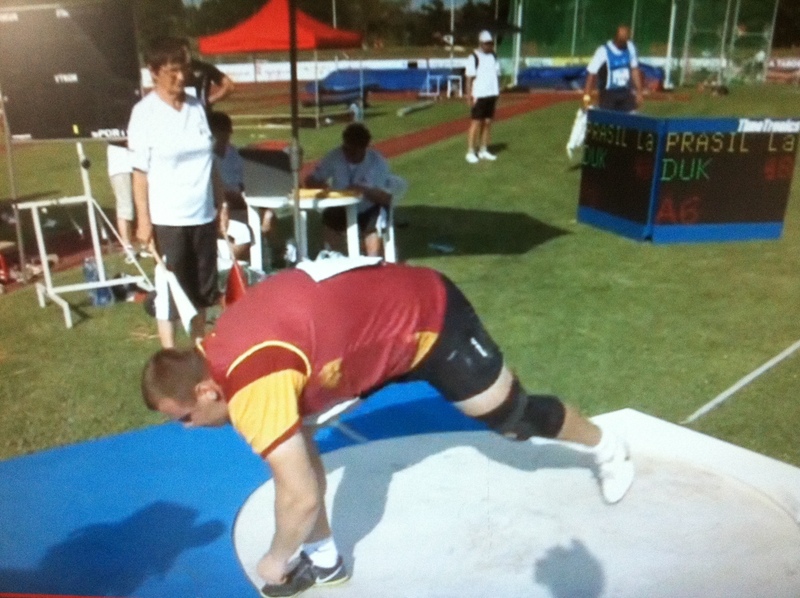 The same principal applies to the shotput. Variation of the path of the implement robs the putter of the best chance to accelerate it. Prasil does a great job of keeping the shot on a straight path. One further comment on that last photo. Many regard Ulf Timmerman, the 1988 Olympic champion from the DDR, as the greatest glide technician ever, and I agree that he was fantastic. Watch a video of him at regular speed and you will be awed by his explosiveness. Like Prasil, Ulf was a short-long glider. One prominent difference between their techniques, though, is that Ulf blasted his left leg hard and low out of the back of the ring as if trying to shatter the toeboard with the force of that left leg extension, while Prasil reaches his left leg higher and less aggressively. When introducing the short-long to young throwers, it is best to adopt Prasil’s approach. 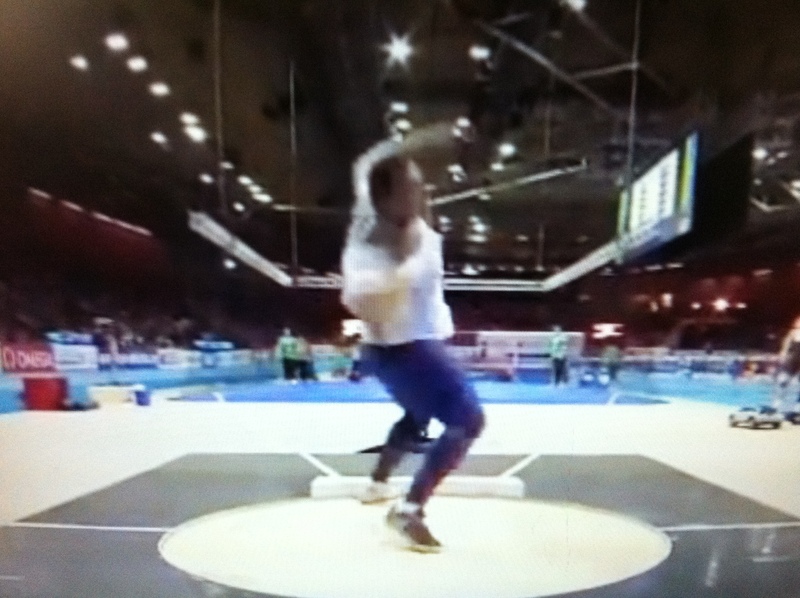 Blasting the left leg too hard and too low out of the back of the ring will cause the shoulders of most novice throwers to pop up, thus making it difficult to keep the shot back long enought to let the right hip do its work. Think of the line connecting the putter’s head to his left heel as a teeter totter. Push one end of a teeter totter down and the other end must come up. Timmerman was able to avoid this pitfall by keeping his upper body totally passive even as he lashed his left leg toward the toeboard. Unfortunately, most of us coach athletes who are to Timmerman as a Volkswagon beetle is to a Porshe, and trying to replicate this aspect of his technique is a mistake. Let’s take a look now at Prasil’s position as his right foot touches down after his glide. 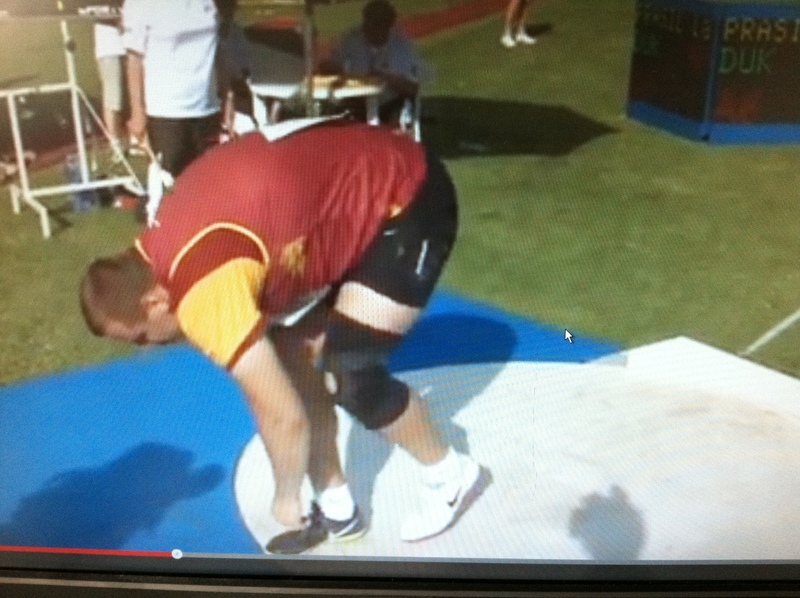 This is classic short-long shotputting. Allow me to draw your attention to three technical matters. First, Prasil’s right foot lands at a 45-degree angle. Some would argue that in order to give the right hip its best chance of firing into the release ahead of the shot the right foot must land at a 90-degree angle. Parallel, in other words, to the toeboard. Remember, though, that we must strive to accelerate the shot along a straight path. Turning his foot to 90 degrees might cause a premature opening of the right hip and shoulder which would yank the shot off of its straight path. Best to ground the foot at a 45-degree angle to facilitate keeping the shot back. And, as you will see, Prasil has no trouble firing his right hip with his foot at this angle. Second, notice that when Prasil’s right foot touches down his left foot is still in the air. This allows him to keep the shot way back, and to blast into the throw with a natural right-to-left action. Hand one of your athletes a softball and tell them to throw it as far as they can. Will they hop, land simultaneously on both feet and then jump into the throw? Not likely. My guess is that they will stride into the throw, right-to-left like a javelin thrower. 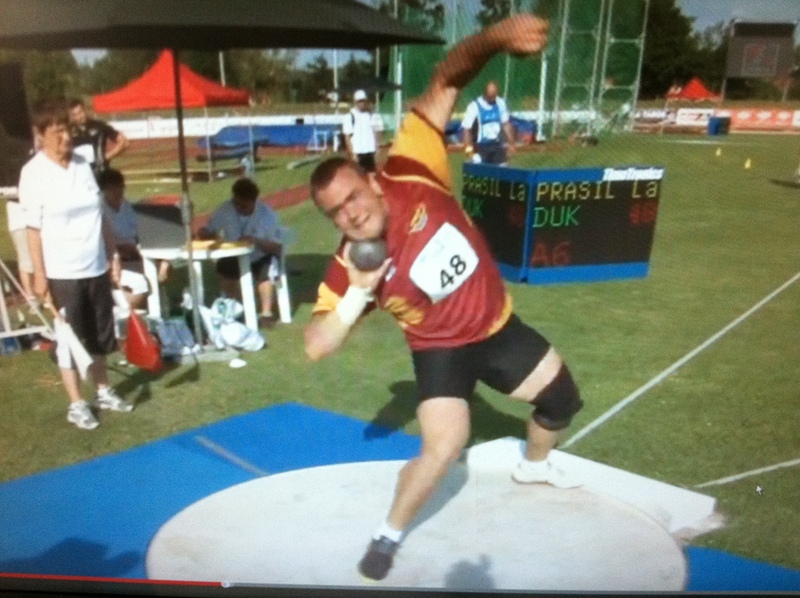 A shotput is obviously a lot heavier than a softball or javelin, but short-long gliders still incorporate this action into their technique, and Prasil provides an excellent example of doing so successfully. 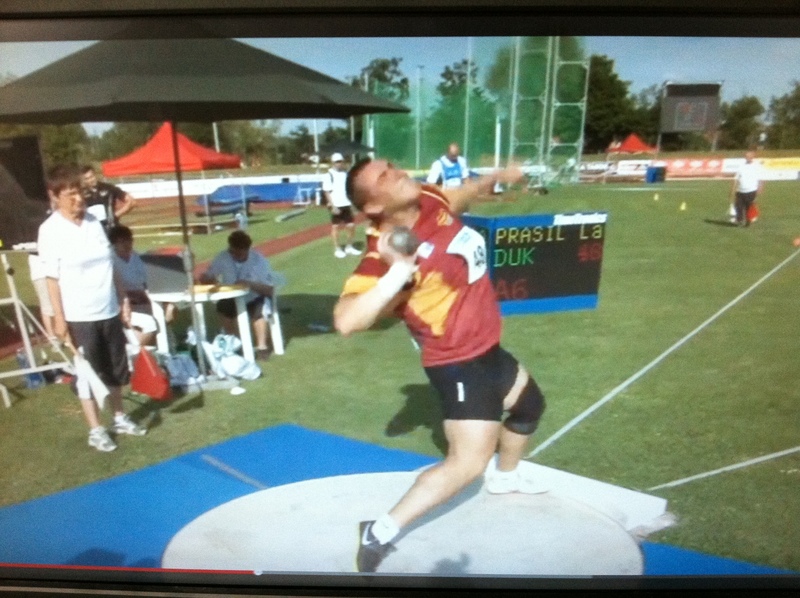 Finally, notice that Prasil’s left arm is beginning to lift as his right foot lands. This is another sign that he is determined to keep the shot on a straight path. 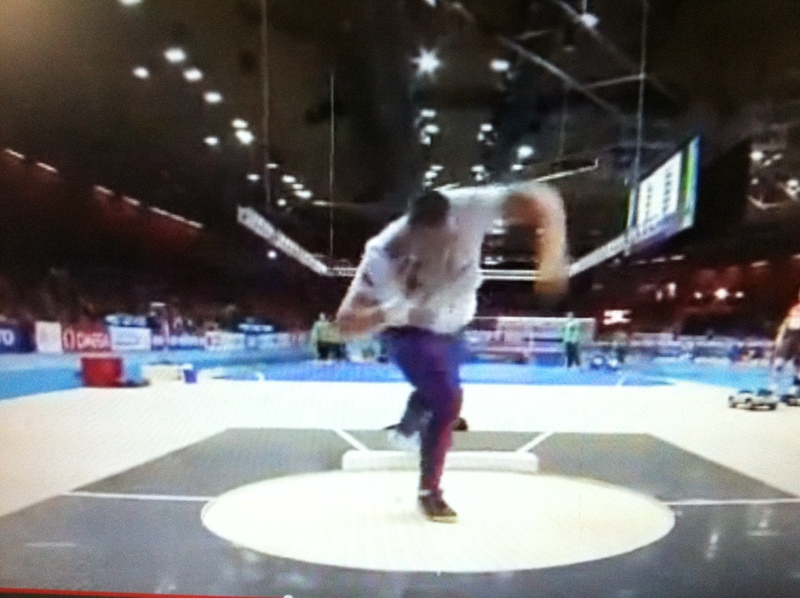 Many young throwers are taught to reach their left arm back as they glide, in an effort to keep them from opening their shoulders prematurely and allowing their upper body to get ahead of their right hip as they drive into the throw. Keeping the left arm back too long, however, can muck up the timing of the right-to-left throwing action and–you guessed it–cause the shot to deviate from a straight path. 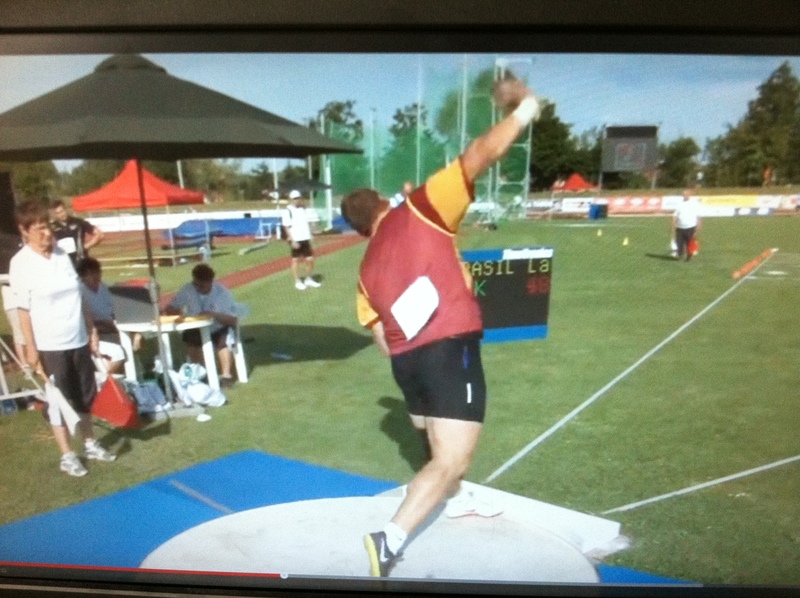 Young throwers must be taught to keep the right shoulder back as the left arm opens. This takes a lot of practice and tinkering, as many of them will naturally turn their head and and rotate both shoulders as the left arm sweeps, but…what can I tell you? Anyone looking for a sport at which they can instantly excel should try boogie-boarding or thumb wrestling. So, Prasil has done a great job of setting himself up for a big throw. Let’s see how he finishes it. It is crucial that the right heel pops up and the right knee and hip fire immediately after the right foot touches down. That, again, is why many argue for the foot to land at 90 degrees. But as can be seen here, Prasil does a magnificent job of blasting his right knee and hip ahead of the shot. Let’s take a look from the other angle to see how he does with keeping the shot on a straight path. Pretty good, huh? By keeping his upper body relaxed throughout the glide, by clearing the left arm while keeping the shot back, and by being an all-around stud-muffin, Prasil succeeds in blasting the shot up and out along a straight path. Two comments on these final images. 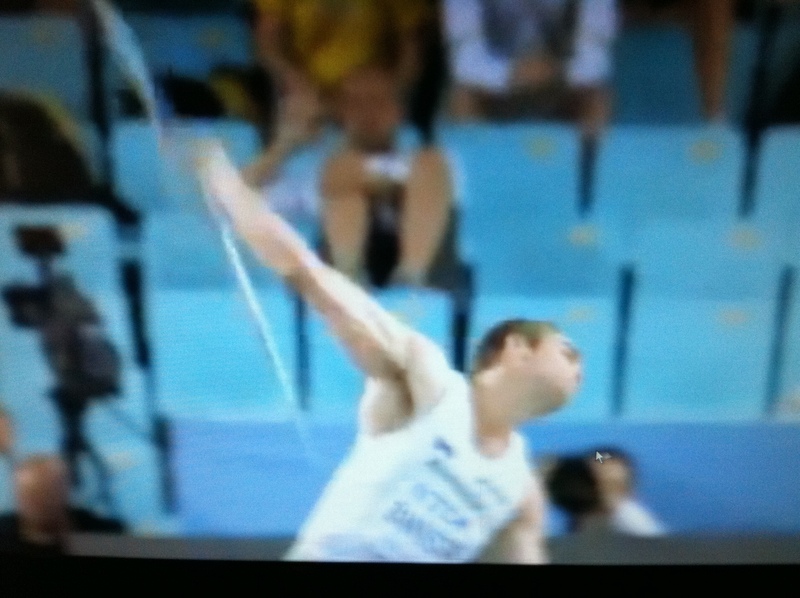 I am a big fan of fixed-feet throwing. The laws of physics dictate that in order to exert maximum force on the shot, you have to have a solid base to push against. The old cannon-in-a-rowboat analogy. I know that most successful gliders at the international level reverse. David Storl. Tomasz Majewski. But guess what, brother? You and I are not coaching athletes like that. They are 6’5″ (Storl) and 6’9″ (Majewski) and extremely athletic. You know where the high school versions of those guys end up in this country? On a basketball court twelve months of the year getting screamed at by some 5’8″ guy with slicked back hair. We get the guys with the three-inch verticals that can’t make the basketball team. And for them, fixed feet throwing usually works best. And by the way, I guarantee you that Storl and Majewski have taken about a million fixed-feet throws in training. All I can say about this is that you, as a coach, must monitor this carefully. You absolutely do not want your shotputters yanking their heads to the left as they release the shot. Train them to remain as upright as possible as they flick the shot away and realize that to some extent, tilting to the left is inevitable. But don’t let it get out of hand. Finally, finally, I want to acknowledge that Prasil is a magnificent athlete. Normal people do not throw 21 meters. Normal people throw 10 meters and then become coaches. 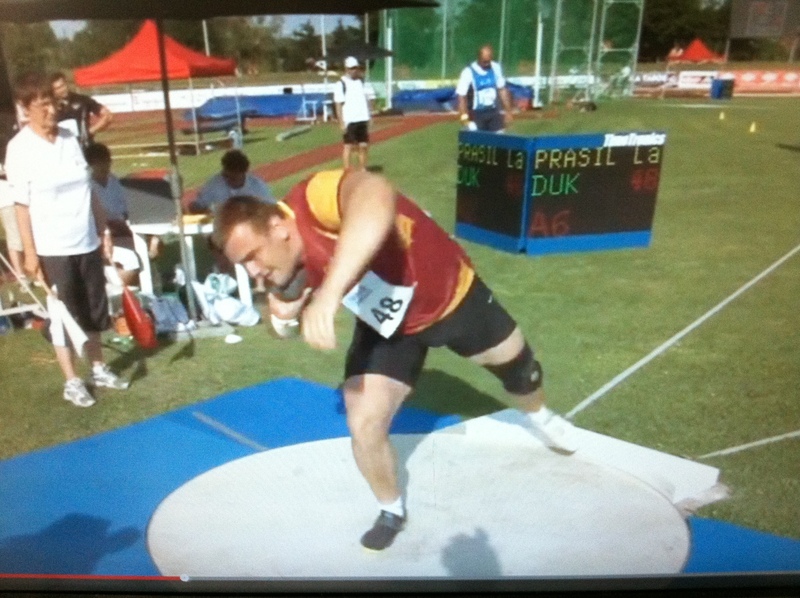 That said, I believe that his technique is more applicable to the average high school thrower than the technique employed by Timmerman, Storl, or Majewski. Good luck to everybody out there this indoor season! Excellent work. We have discussed many of these points before. Here’s a question: Do you force throwers to non-reverse? 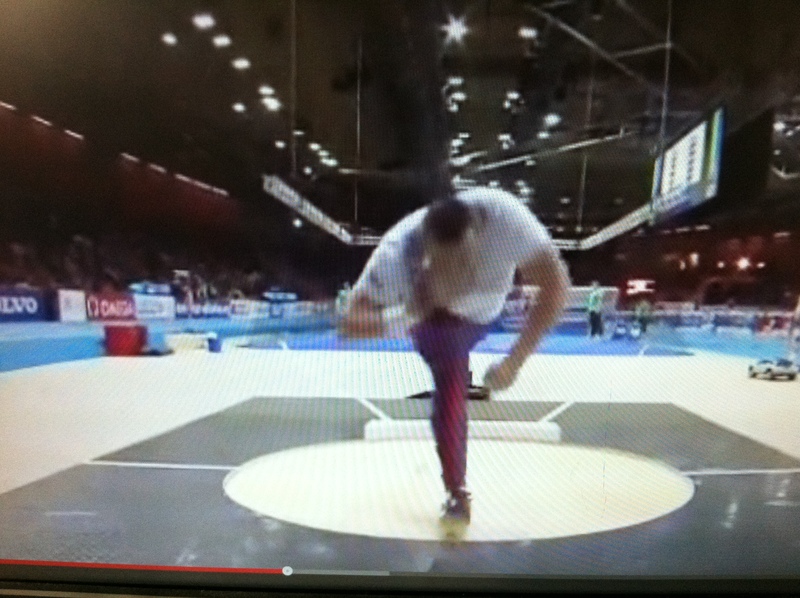 What I do is this, if there is a thrower that naturally reverses, usually I leave them be, and do try to force them to do non reverse drills. If I have an athlete that never reverses, I don’t mess with them. Does this fall under the heading “individual differences”? How do you get the shot under the jaw? I think the problem is I can’t do it, so I can’t get others to do it. I sense the advantages of doing it. And I can kind of do it on a stand throw. But it feels like it’s going to crush my throat or break my jaw. Now this is out there a little bit, but I wonder about the whole short-long, long-short designations?? I used to be all about that, but now not so sure. To me it seems that the “long-short” was derived from an early 70s infatuation with Al Feuerbach and coaches simply looking at his film, seeing his movements, and making generalizations based on that. Gliders of the 60s and gliders worldwide have not been overly successful with what I would now call Feuerbach”style” (style vs. technique). Is that short long long short long long short short medium long short medium medium long short? What do you think? Also, not ripping on fellow Iowan Al F. It pains me to even have written a negative connotation!! I start everybody out fixed feet, and advise them that they should never “try” to reverse. If they start getting out over the board and have trouble saving throws, I tell them to knock the hell out of it, try to hold their block, and–if they have to–just replace the left foot at the toe board with the right. A “late” reverse. I do this because many kids, when they are told to reverse, start picking up their right foot during the release. I started working on reversing with my young spinners a couple of weeks ago, and a freshman that I really like has been picking up his right foot ever since. We will work through that, but one of the nice things about the glide is that we can avoid that issue altogether. That said, there have been two times during my career when I actively encouraged a glider to adopt the reverse. In both cases, the kid was not patient enough to stay back and take advantage of the long path of acceleration that the fixed-feet short-long offers. After a couple of weeks working with a reverse, they improved greatly. 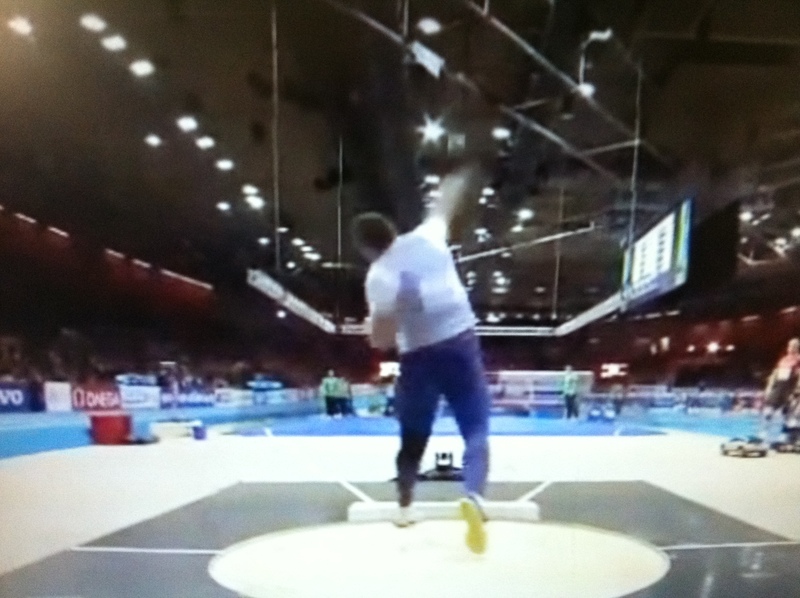 Last year, I had a kid who threw 54′ with a fixed feet glide, but I began to suspect that he was like those two kids who benefitted from reversing, so we began working on it and it messed him up big time. Guess that’s why they pay us the big money. Thanks Dan for analysis. The first coach my son had a great influence on his technique. But I think that is still reserve in the final stage, if compared Ladislav with David Storl. Ladislav also saves his knee. Are you Ladislav’s father? If so, congratulations on his fine performance in Prague! Thank you very much! I believe it was an extraordinary experience for our son. Hall in Prague is great, there were many supporters. Such an experience (being medalist in his own country), it is surely always exciting! I’m really happy that I could have seen. I hope he will be ready for Rio. Super article Dan. Really enjoyed the read. It clarifies some things for me. 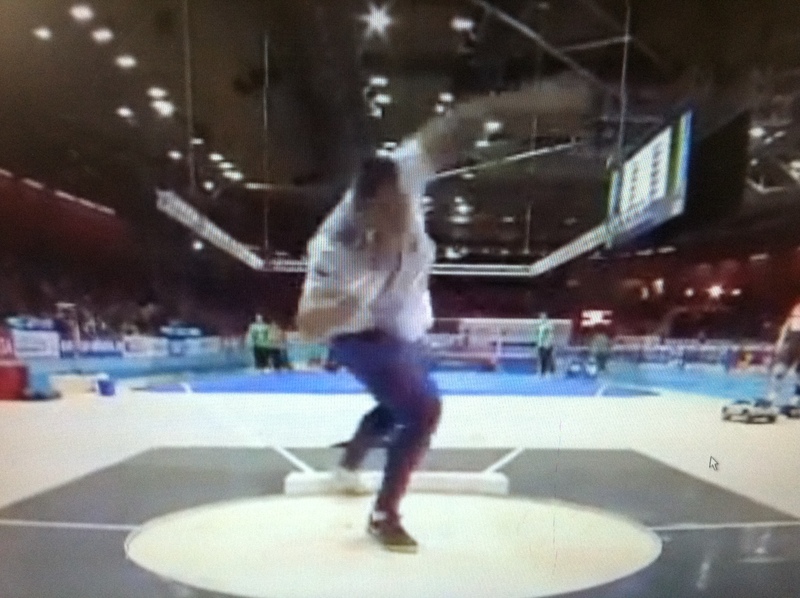 Prasil is a very nice thrower to watch and copy.